We were busy today making preparations for Saturday’s RoboFest ’09 with the Kansas City Robotics Society. We have a new base for our mid size labyrinth and decided to go with a golf theme for this version. This game is a little easier to play than our small wooden labyrinth but with the ridges and hills built into this course it’s not an easy game either. 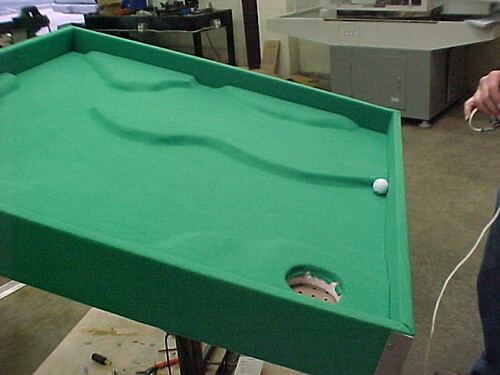 This picture shows the unfinished hole awaiting the cup for the golf ball to fall into. A narrow ledge and varying steepness leading up to the hole makes this approach tricky. Come check it out if you happen to be in Kansas City on Saturday June 13, 2009. The RoboFest will be held in the upper level above the Harvey House Restaurant in the historic Union Station. The times are from 12:30 pm with robots competing until 4:00 pm. Awards will be given between 4:00 and 4:30. Several competitions are planned including mini and 1kg sumo robots, line following robots and a dinnerware demolition competition. We plan to have solar rollers there too. Check out our LabyWiinth Project Web Site and the new DIY Robotics Lab blog. Its been over two months since my last post about the Robotic Labyrinth project for Science City. The project slowed to a more deliberate pace but has not stopped. We are still making progress but acquiring the materials we need have slowed things down quite a bit. We now have our extruded polystyrene foam insulation board for our maze platform’s sandwich structure and the aerospace adhesives to glue the maze together. Our next big hurdle is getting aluminum to begin fabrication of the maze table. Richard found these great linear actuators that we are testing. They are providing quick response and an incredible range of motion. 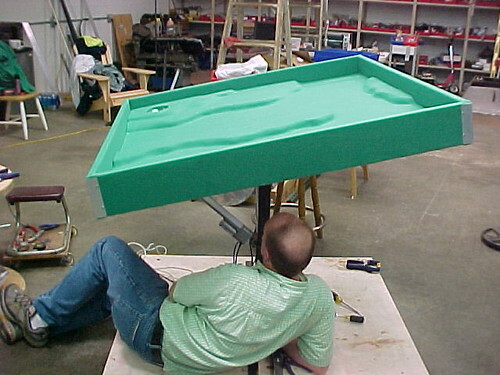 Support Platform for the Maze. 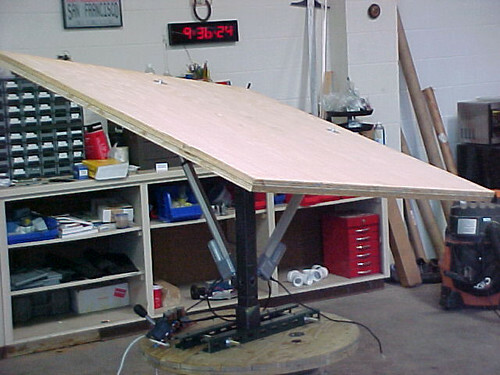 We have a 4′ x 4′ platform constructed from two sheets of 3/4″ plywood. This is planned to support our maze table on top of the structure. We are still waiting for the labyrinth’s base to get out of the sheet metal shop so for now we’re using a spool with electrical cables for weight. 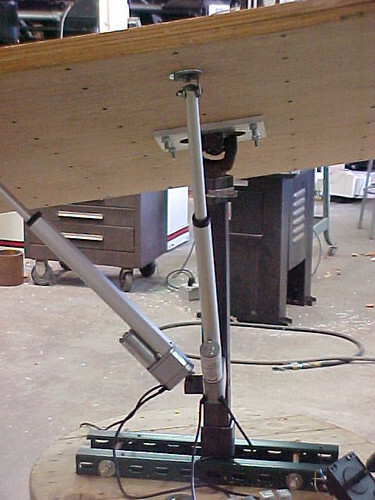 This view shows our universal joint mounting plate on the underside of the maze support platform. We are able to move the platform with the joystick. 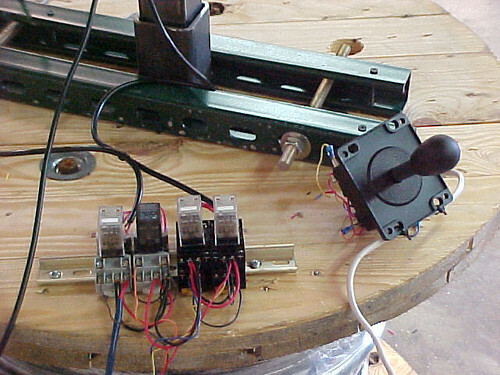 It is temporarily controlled using relay switches. I need to get our Robotic Labyrinth game platform modeled in Alibre CAD before the trial period runs out. So, I started catching up on some more of the free training videos from the Alibre web site. Their videos formatted in the WMV format are working fine but I’m not able to get other video sessions using the AVI file to work. I tried searching the Internet for solutions to this problem. One suggestion I found was to use Handbrake to convert the AVI file into something I knew was working. I downloaded Handbrake a few weeks ago so I gave that a try. It worked but was taking over an hour to convert the file so I kept looking for solutions. The solution comes from the GSpot Codec Information Appliance which analyzes a video file and identifies the codec’s that are not supported on your computer. When I ran the program it identified the TechSmith Screen Capture Codec (TSCC) as the culpret. I found the TechSmith web site and downloaded the TSCC file and installed the solution. The GSpot Appliance will come in handy resolving some issues I noticed a few weeks ago when trying to view AVI files using OpenCV. The Alibre Training Videos are a great resource I only wish I had the complete set to learn from. Not a very productive day today on Science City’s Robotic Labyrinth. Between catching a cold and some family activities I didn’t get much done today. I decided to try downloading some video I shot of the Sheetmetal Workers Union into my computer. I bought a new S-Video cable the other day to connect between the camcorder and Dazzle. For some reason the Radio Shack cable gets fat at the point where it would be plugged into Dazzle. That doesn’t work so I need to find another cable. Building the center pivot base. 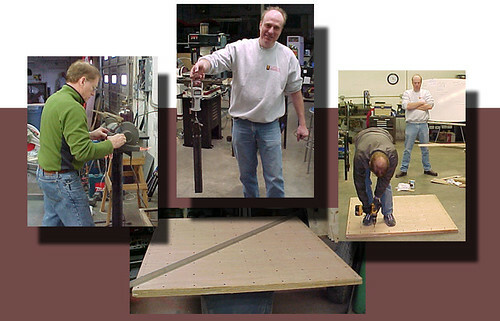 Today we’re making progress on the Robotic Labyrinth’s central pivot and base where the game platform will rest. Even after spending most of the week in the hospital, Tom came by with a drive shaft for the project. He was feeling a little weak and had to leave early, hope he gets feeling better soon. We cut a 3/4″ sheet of plywood in half and rotated the pieces 90 degrees from each other then began gluing and screwing the pieces together. Reminiscent of Junk Yard Wars, we began cutting the drive shaft apart to use it’s universal joint for our pivot point. 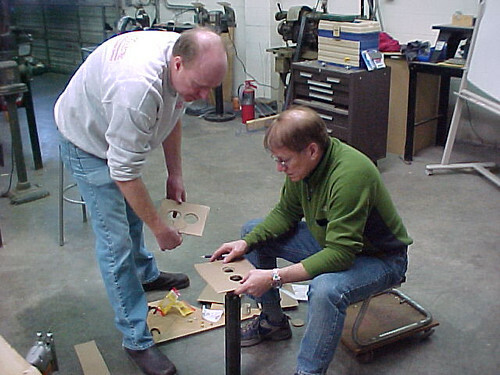 While I was out looking for parts Rich and Bob began cutting out a template to build a plate for our plywood base to sit on. 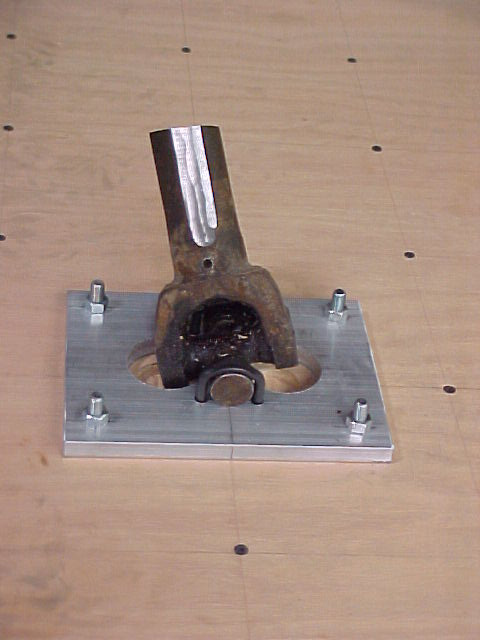 This plate will connect the universal joint and the base together. I brought back u-bolts from an auto parts store to fit around the bearings, this kit is the Dorman 81002 U-Joint retainer kit. The drive shaft was from a 73 C2500 chevrolet 4×4. It was the from shaft for the transfer case. John Bergin sent me an email about an old short film the LabyWiinth reminded him of.